UPDATE 5/29/16—Instant Rebates on all AudioBox VSL Interfaces Until July 31, 2016! 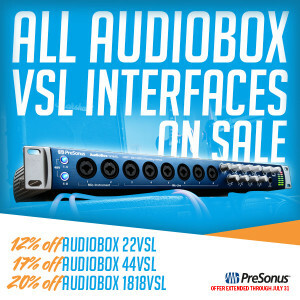 We’re offering discounts of up to 20% discounts on the award-winning PreSonus AudioBox VSL family of recording interfaces. These instant rebates are easy price drops at the register and require no paperwork, proofs of purchase, or wait times to get your money back. Just take a chunk of change off the price. What if I JUST Purchased the 44SL?